For additional information on upcoming field trips, such as whether to bring snacks or a bag lunch, and the need to dress appropriately for the weather, please consult the current Newsletter. "DO IT YOURSELF!" Members may use the form on the Update page to post a forthcoming field trip on on the list above, as long as it has been approved by Allen Larner or Jo King. Newly-added field trips are automatically placed at the end of the list. If any corrections are necessary, please contact the Webmaster at agclem_AT_comcast.net. 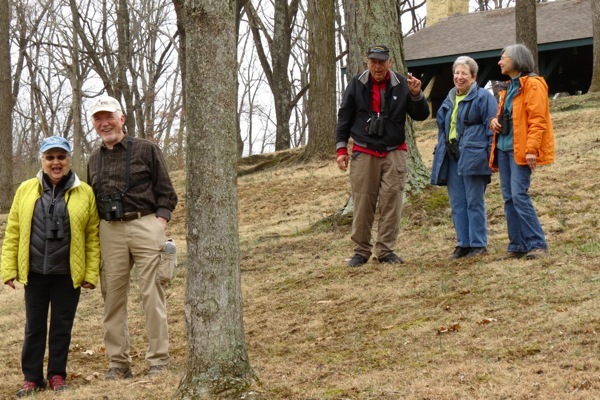 Jo King, Ed Lawler, Stan Heatwole, Bonnie Hughes, and Linda Corwin at the February 24, 2018 field trip to Montgomery Hall Park. Each year the Virginia Society of Ornithology conducts a foray, focusing on a specific area of Virginia during a week-long period, usually in June. The 2013 foray was conducted in neighboring Rockbridge County, and the 2014 foray is being conducted in the Dragon Run area of Middlesex and King & Queen Counties. For more information, see virginiabirds.net. The Rockfish Gap Hawk Watch begins each year around the middle of August and runs through the end of November. Jointly coordinated by Brenda Tekin and Victor Laubach, it is held on the grounds of the Inn at Afton, located on the southern side of Rockfish Gap in the Blue Ridge Mountains, right off I-64 exit 99 (at the intersections with Rt 250, the southern end of the Skyline Drive and the northern end of the Blue Ridge Parkway) just 5 miles east of Waynesboro and 20 miles west of Charlottesville. 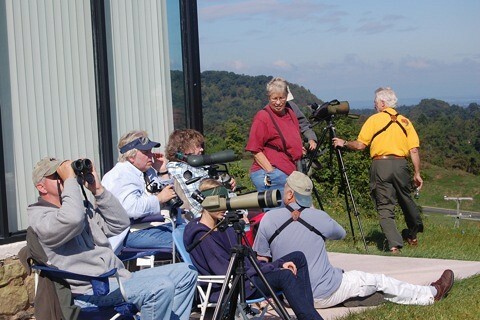 The hawk watch provides panoramic views of the gap and both the Shenandoah Valley to the west and the Piedmont Region to the east. Be sure to bring your binoculars, a lawn chair and sunscreen! We'd love to have you visit and experience the raptor migration (and help us spot the hawks)! For further information or questions please visit the Web site: www.rockfishgaphawkwatch.org! The survey results, along with analytical articles, are published in a special magazine supplement. The GBBC is usually held in February, sponsored by the National Audubon Society. The results are posted at www.birdcount.org.